February 13, 2016 February 13, 2016 ~ Trevis Dampier Sr. So my wife and I arrive in the heart of downtown Mountain View to find a slew of people ready to dine and drink to have some evening enjoyment. We walk into the 2 floor Chinese restaurant of Fu Lam Mum and it is packed to the core with majority of my Asian-American friends. We sit down and are served our hot tea and we immediately get our orders in. 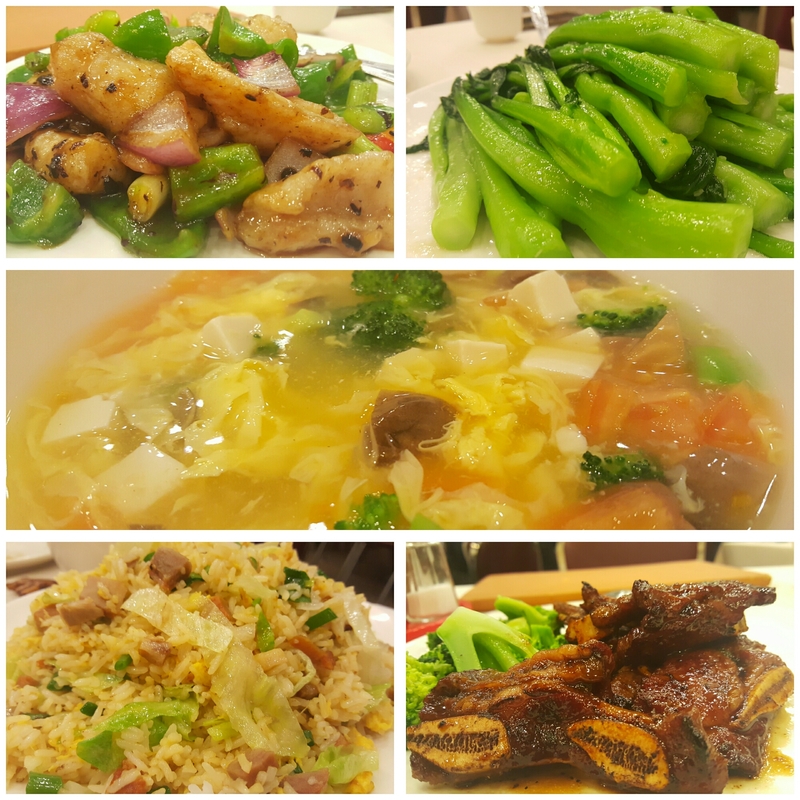 Our meals today will be Egg Flower Soup, Fish Fillet with Black Bean Sauce, Beef short ribs with black pepper honey sauce, Yu Choy with Garlic, with BBQ Pork Fried Rice. First arrives the Egg flower soup..
Light and flavorful and prepares our palates for the main dishes to come. Every sip was of exotic delicacy that brought me utmost enjoyment. Time for the real deal HolyField festivities to begin! I dive into the beef short ribs first and got smacked with large burst of flavor. Tender and sweet with a sauce that makes you cringe with satisfaction! A perfect crisp layer on this delicate super tender and super powerful flavored fish that will knock your socks off. Time to slow this party down some and taste the BBQ Pork fried rice. Rice that is nice and fluffy with all kinds of flavor from the sweet tender pork pieces and egg posing inside. Then I take a bite of the Yu Choy with Garlic and receive nothing but excellence when I bit into this crunchy garlic flavored veggie delight. Bite after Bite..Chew after Chew..Moan after Moan.. Nothing but True Live Action Chinese New Year Eating! Great job Fu Lam Mum! I hope you all enjoyed your Chinese New Years.We’ll definitely continue this next year. < Previous Saturday Night and I can hardly wait to Wine and Dine with friends at Straight’s! Next > Happy Valentine’s Day! Celebrate before it’s Gone..Today I kicked it off at Le Papillon!